Yes, Charles wants this filled with homemade pies. Dream on. The other day I posted a photo making fun of my darling husband, and his tendency to leave stuff laying around. 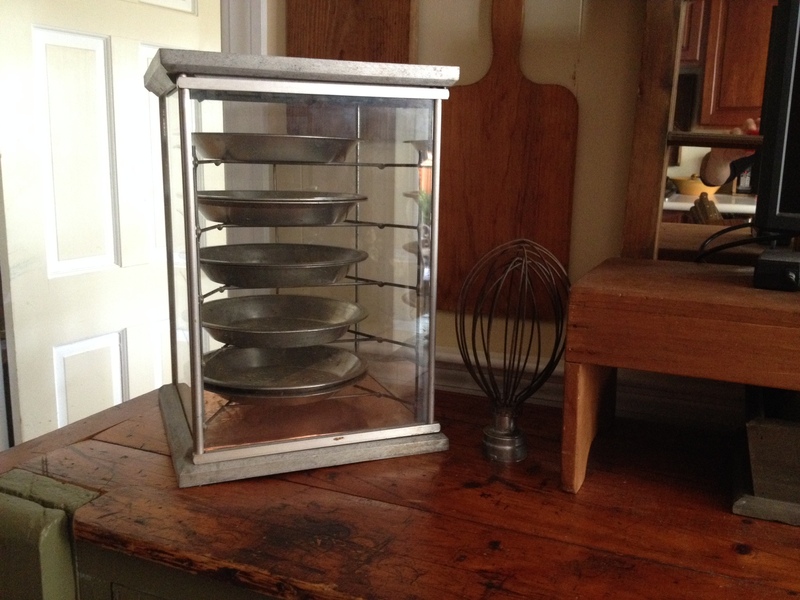 One of the items in that photo caught the eye of one of his friends, it was the pie rack pictured above. For people who like kitchen or food-related junktiques, Table Talk signs, pie tins, delivery crates and more, are desirable collector items. This pie rack was typical of what you would see in a local diner decades ago. It was sitting right on the counter, to tempt you into having a slice of pie, as you were sipping your cup o’ joe. Charles’ sisters and I all bake decent pies (Charles insists we make “excellent” pies, but I believe the old man is just a little biased). We all are capable of making flaky homemade crusts. We make Canadian Meat Pies, and all kinds of fruit pies, Lemon Meringue pie, and the list goes on. Though we all bake good pies, they are all different, even if they evolved from the same family recipe. Charles has told me of the many mornings he was working on his Dad’s truck as a boy, when they would stop at a local diner for breakfast. Dad would get bacon and eggs, and little Chuckie would get chocolate milk and a piece of pie. It’s funny how the everyday items of our childhood can transport us back in time.